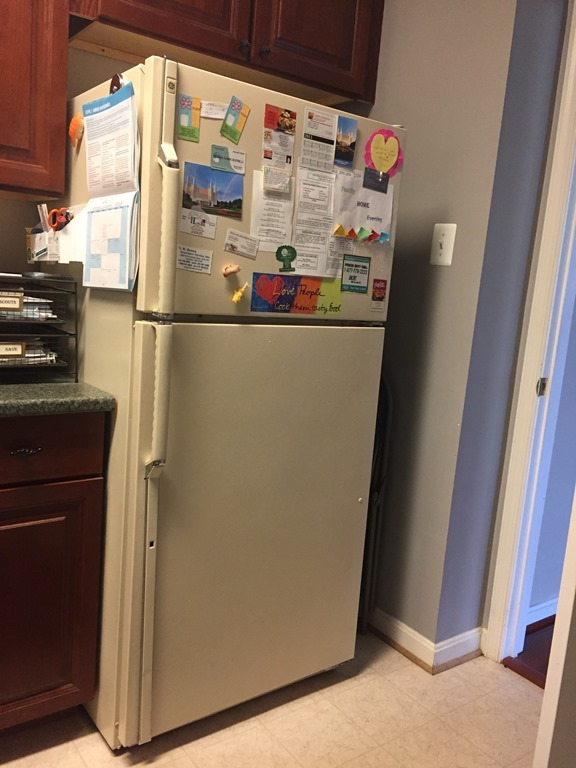 In our laundry room is an old refrigerator. It isn’t fancy, doesn’t dispense water or ice, or sync to your phone to create grocery lists. But it is magic. As my husband and children like to observe, whenever someone takes the last custard from this fridge, more magically appear again the very next day. They love this Magic Fridge. It must be that same Magic that turns full laundry baskets into piles of folded clothes, raw ingredients into hot meals, and grimy bathrooms into sparkling retreats (okay, that might be wishful thinking; I’m still waiting for that kind of magic to appear). 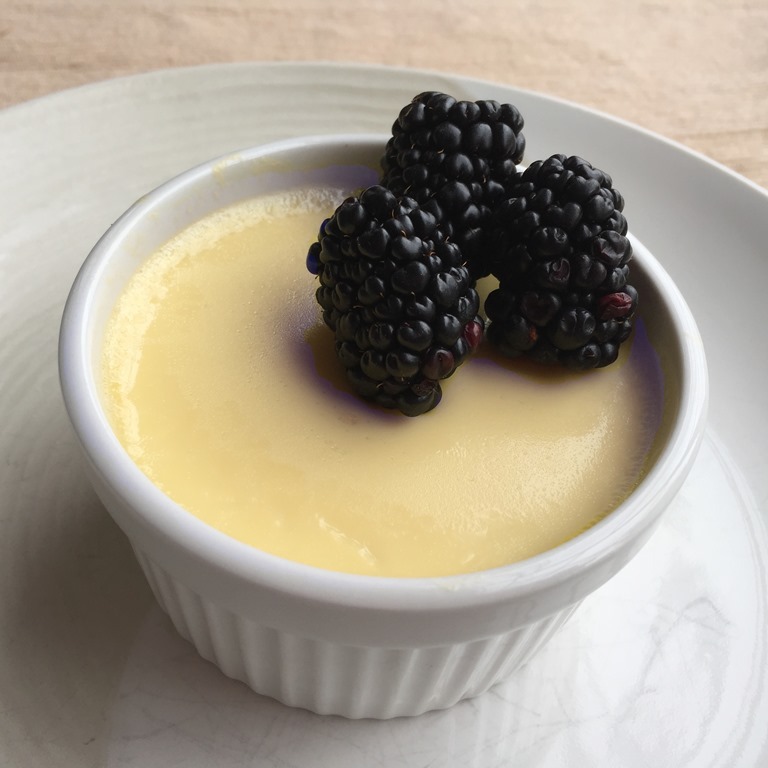 But if you’re looking for a simple egg custard that is easy to make sugar-free, this is definitely the kind of magic I can help you with. Stevia is my favorite non-sugar sweetener, but it can sometimes be bitter if it is used alone to sweeten desserts. 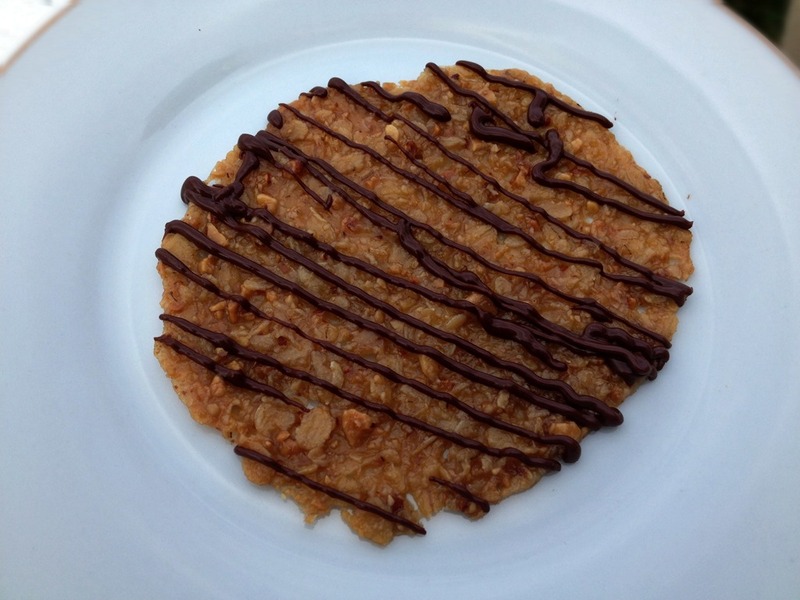 For this recipe, I combine stevia with erythritol. You could also use Splenda (or go for an all-sugar version). In a mixing bowl, whisk together eggs, egg yolks, stevia, vanilla, and salt. Heat half & half until very hot, but not quite boiling. (You can do this either in the microwave or on the stovetop). Remove from heat and stir in erythritol. While whisking constantly, slowly pour the hot milk in a steady stream into the mixing bowl with the eggs. Do this very, very slowly at first, or you will curdle the eggs. Strain the custard through a mesh sieve to remove any lumps. 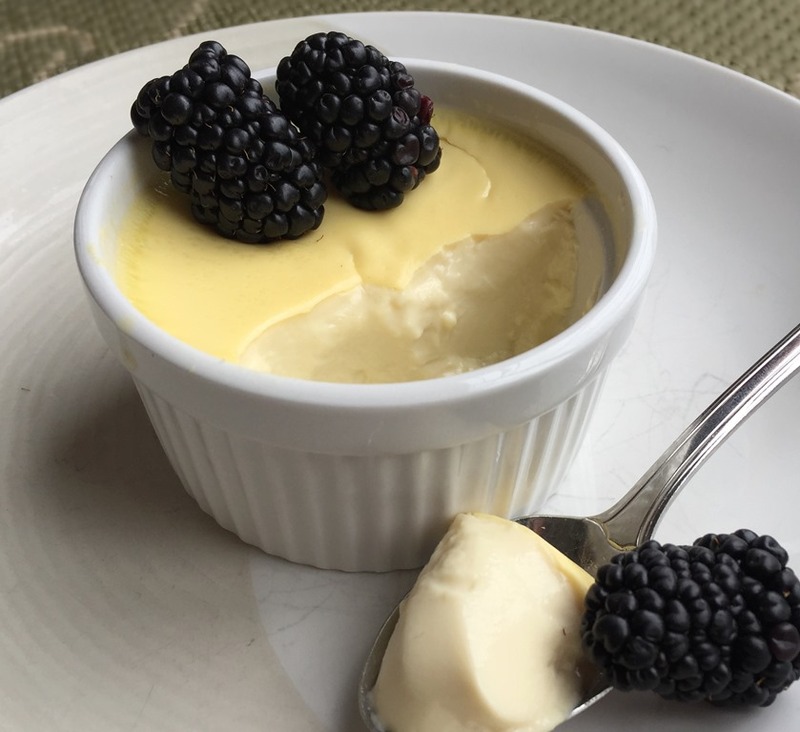 Pour custard into small ramekins. Fill bottom of the larger baking pans with hot water to halfway up sides of ramekins. We went to a church fall festival activity tonight, and I brought this banana cream pie as well as this Chocolate Peanut Butter Pie: RECIPE HERE. I was not planning on posting the banana cream pie recipe yet, since I only got a couple of not-so-great photos of the whole pie before we left. And there were no left-overs to take a picture of after getting home. But I have had a few requests for the recipe, so I am going to go ahead and post the recipe without the “inside” pictures. 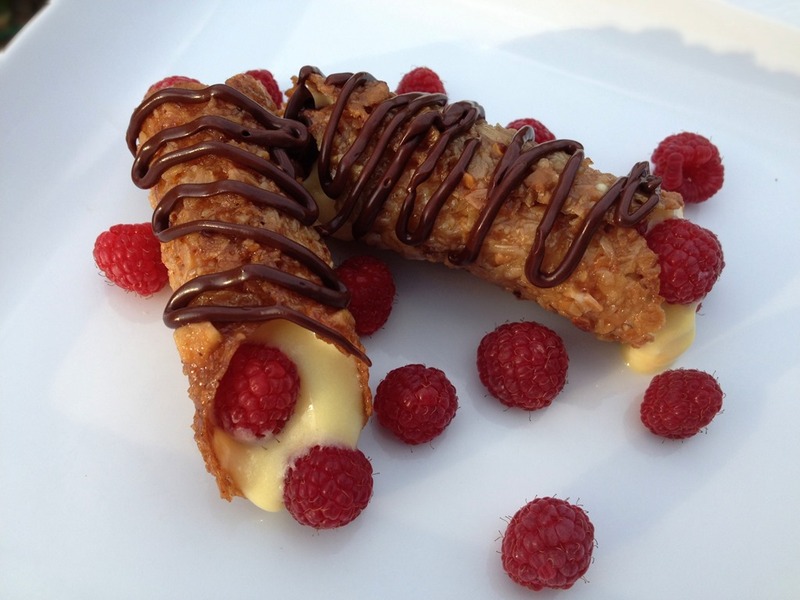 So you will just have to imagine layers of flaky crust, salted caramel, bananas, homemade custard filling and whipped cream. And once you have gone to the trouble of making salted caramel, it goes well with just about everything else you might want to drizzle it on. 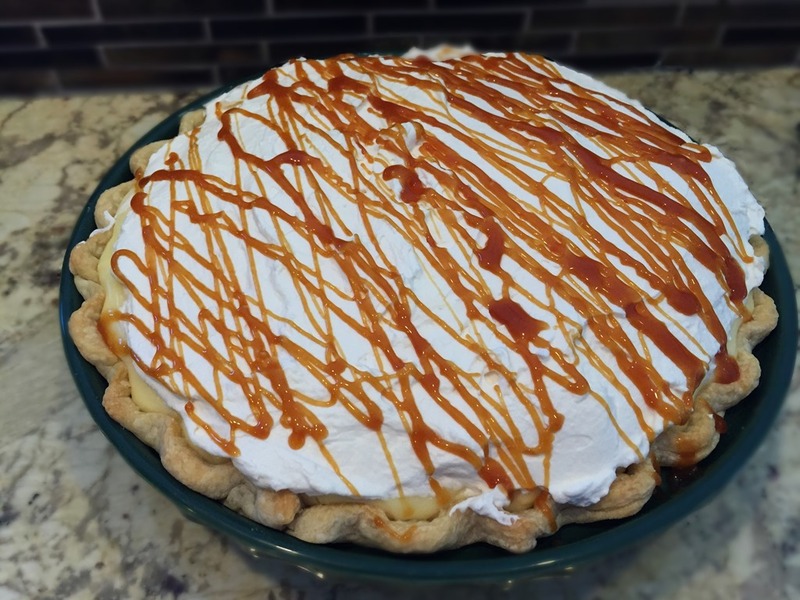 This recipe was inspired by the many Salted Caramel Banana Cream Pies eaten on “Pi Day” at the Kings’ house in Pittsburgh. Not having Tony’s pies to look forward to every year now, I had to buckle down and make one for myself. Bake and cool pie crust. Spread 3-4 tablespoons of salted caramel sauce over the bottom of the cooled pie crust. Slice 1 ½ bananas and place in single layer over the caramel sauce. Spoon half of the slightly cooled vanilla custard over the bananas. Slice remaining bananas (slice them thinly) and place over custard. Top with remaining custard filling. Refrigerate until well chilled, at least 1-2 hours. Combine cream, powdered sugar and vanilla in a mixing bowl. Mix using an electric mixer until soft peaks form. Add cream cheese and beat until stiff peaks form. Spread over chilled pie. 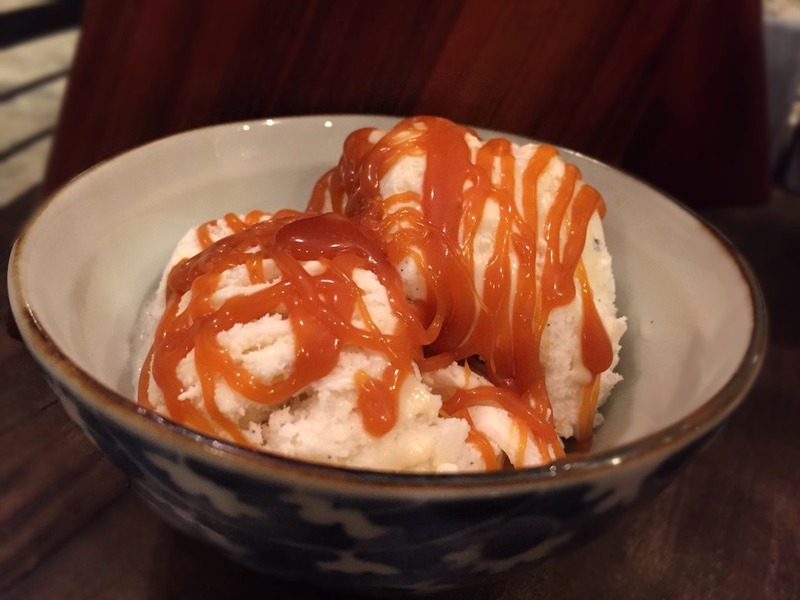 Drizzle with additional salted caramel sauce and chill until serving time. 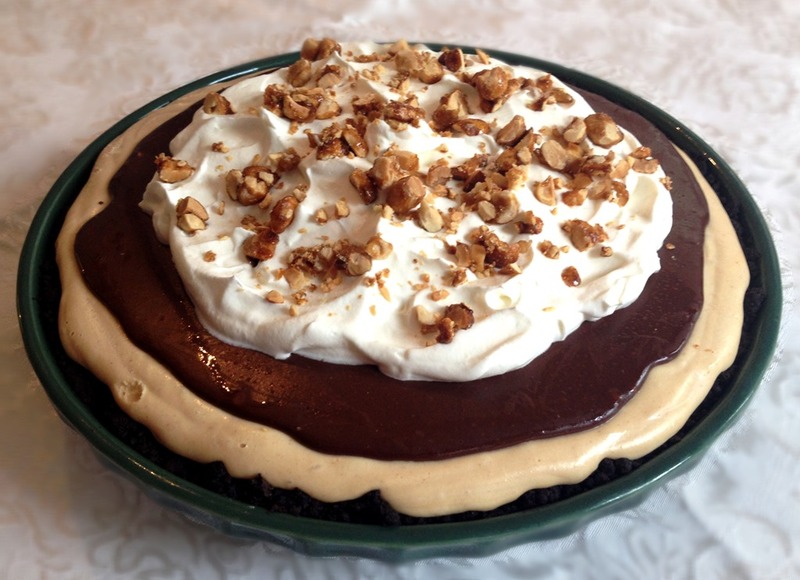 Serve pie with additional Salted Caramel Sauce. Combine sugar, cornstarch, milk, cream and egg yolks in a medium saucepan. Whisk until well mixed. Cook over medium heat, stirring often, until thickened and bubbly. Remove from heat and stir in vanilla. 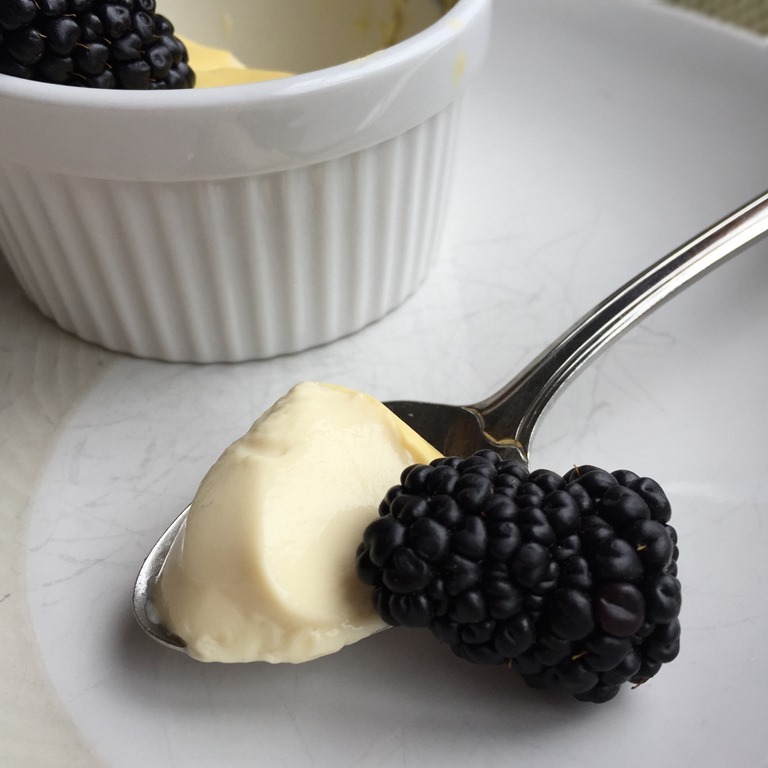 Add cream cheese to hot custard about 1 tablespoon at a time. Stir with a whisk until cream cheese is completely melted and custard is smooth. Cool for 15-20 minutes before pouring into pie crust (stir occasionally so that it doesn’t form a skin). Place sugar in a medium to large saucepan (mixture will bubble up and expand as cool ingredients are added to the hot pan). Cook over medium heat until sugar just begins to melt. Stir gently, trying to keep sugar crystals off of the sides of the pan. Continue to cook, stirring occasionally, until sugar melts completely and is a medium amber color (about 350°F if you use an instant-read thermometer). Reduce heat to low and quickly whisk in butter chunks, stirring constantly. Remove from heat and stir in cream, whisking constantly. Stir in salt and vanilla. Pour immediately into a glass jar or heat-safe bowl to cool. Do NOT scrape sides or bottom of the pan with a spatula. If you do, you are likely to get sugar crystals into your nice smooth caramel. 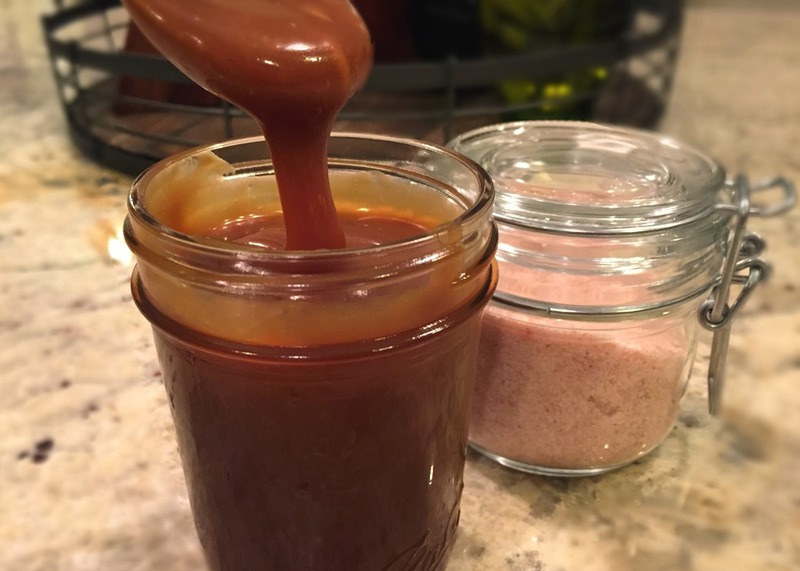 If the caramel has formed crystals while cooking, you can pour it from the pan through a fine sieve into the jar to remove any crystals before cooling. Caramel can be kept in a covered jar at room temperature for several weeks.